Bob Marshall and Betty Earl of Katie Laine Gardens in South Carolina featured this arrangement on their refreshment table for the 2006 AHS National Convention the Carolinas. It was as elegant as anything I have ever seen. Two containers were used, one was a concrete (or resin) swan planter and the other was that tall columnar pedestal you see in the photo. The two were arranged in a wonderful way. These are the little touches you notice and remember on garden tours; the moments that the garden owner took to take your visit from the common to the extraordinary. Look around for some whimsical containers that would do great as daylily displays. Pick up a block of wet foam by Oasis (or the like) and go to town! (Note: Make sure when you place your wet foam in your unique container that you place it in a foil or plastic lining to prevent it from leaking or ruining your container.) 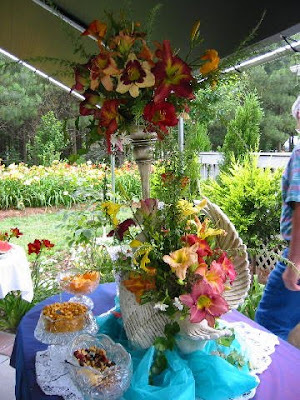 I would love to see photos of table arrangements using daylilies, or other wonderful accents you have seen on garden tours. What wonderful gardens come to mind? Where are you itching to visit again? How lovely. I miss flowers already and wish it was time for the lilies to bloom again. I can see the rows of lilies in the background of the picture also. I am waiting until the day my lily bed looks that lush.Hope you had a wonderful Thanksgiving. Beautiful! I love tall designs. I am glad you liked the design. I miss the daylilies, too. Before it snowed last night I had a chance to go out and stroll the beds to take one last look at them before they are buried for the winter.